The floral honeyed tones of chamomile beautifully complement the sweetness of corn. 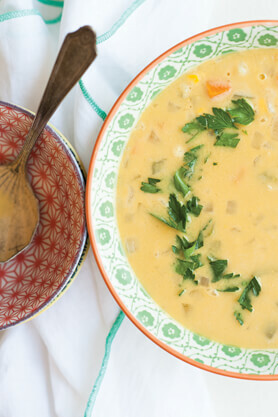 This chowder owes its body to being half puréed, rather than to cream or butter, making it naturally vegan. I use frozen corn here, but if you’re lucky enough to find fresh organic corn, by all means use it. Place an 8-quart stockpot over medium-low heat for 1 minute. Swirl the oil in the pot to coat. Sauté the onion and bell pepper for 5 minutes. Add the potatoes, sweet potato, salt, pepper, and chamomile. Raise the heat to medium-high. Once boiling, about 5 minutes, cover and lower the heat to simmer. Cook until the potatoes are fork-tender, about 5 minutes. Raise the heat to high. Stir in the corn and cook for 3 to 4 minutes. Ladle half of the soup and solids into a blender, avoiding the sweet potato. Remove the cap from the blender lid and hold a towel over the opening. Purée until smooth. Return the puréed soup to the pot and stir to integrate. Grind in black pepper to taste. Garnish with the parsley.